This recipe, using 3 eggs, yields more than enough batter to fill 4 (7-ounce) ramekins. I only had 3 ramekins of that size so I used them and another slightly smaller one. Had I known I'd have more than enough batter, I would actually have taken another slightly larger ramekin to fill the fourth. Incidentally, the recipe called for prepping the ramekins by buttering and then coating them with flour...the flour was unusual and I decided to stick with buttering and coating the ramekins with sugar instead. You need 5 ounces of fresh raspberries. Simply crush them well with the back of a fork. You will later whisk that - seeds and all - into the base of milk, thickened with some flour and cornstarch, eggs yolks and vanilla bean seeds. I was a little worried about this rough raspberry puree, wondering if it would be too heavy for the soufflés to lift off with and whether it would provide enough raspberry flavor. Happily, neither of the concerns panned out. Once I folded in stiffly beaten egg whites, I filled my prepared ramekins almost all the way to the top, smoothing it evenly. Then I like to run my thumb around the inner rim of each, which I once read helps soufflés rise more evenly during baking (I always figure it doesn't hurt). ...but they kept climbing pretty neatly and were ready to be pulled out of the oven at this point below! Though with very shaky hands, I managed to take them out of oven without incident. I worked as fast as I could, settling each onto a plate, placing a decorative fresh raspberry on top, and dusting it with confectioners' sugar. You feel such a sense of accomplishment pulling soufflés out of the oven at home. It's as close as I'll get to doing magic tricks and once again, you have to appreciate one of my all-time favorite ingredients - the egg! My smile widened when we sat down and tasted these (dessert came early this past Sunday). They were far better than cotton candy! I love the firmer set edges as well as the steaming warm soft, cloud-like, center. The raspberry flavor is lovely. On another weekend note...we also took a trip to our local farmer's market on Sunday morning. It's so nice to walk around and see what's available and be inspired to cook accordingly. We picked up some scallops, asparagus and things, and I ended up whipping up this seared scallops with angel hair pasta for dinner (the little guy might have had pizza). The scallops were amazing! So now I'm out of the clouds of Mother's Day but enjoying this beautiful bright week we're having. Temps are going way up and I think allergy season may be on its way out so my husband and the little man can hopefully breathe easier. There's still plenty of raspberries to eat (love how all our favorite fruits are coming into season! ), meals to make, and treats to bake. Hope you have a happy, productive week doing many things you enjoy! Preheat oven to 400 degrees. Butter 4 (7oz/210ml) ramekins and coat them with sugar, tapping out the excess. Place ramekins in the refrigerator until ready to use. In a medium to large saucepan, melt butter over medium-low heat. Whisk in the flour and cornstarch. Immediately add the milk and vanilla bean seeds, and continue whisking constantly until mixture thickens like a custard that coats the back of a spoon, about 3-5 minutes. Remove the pan from the heat and whisk in the egg yolks, then the crushed raspberries. Beat egg whites using a stand mixer fitted with the whisk attachment. When the egg whites being to look foamy, add salt. Continue whipping on high speed, gradually adding the sugar, until the whites hold stiff peaks. Gently fold the egg whites into the raspberry mixture until just incorporated, trying not to deflate the whites too much. Remove the ramekins from the refrigerator and set them on a baking sheet. Fill each with batter nearly to the top, smoothing over the surface. Take your thumb and run it around the inner rim of each ramekin (optional, this is supposed to help the soufflés rise more evenly while baking). Place baking sheet into the oven and bake until risen and golden brown on top, 15 minutes. Carefully remove the soufflés from the oven, place each on a plate. Garnish each with a raspberry on top and a light dusting of confectioners' sugar. Serve immediately and enjoy! It was yummy, as souffles always are. : ) Thanks. Sounds like a lovely weekend. I also have a hard time not eating all the raspberries haha. 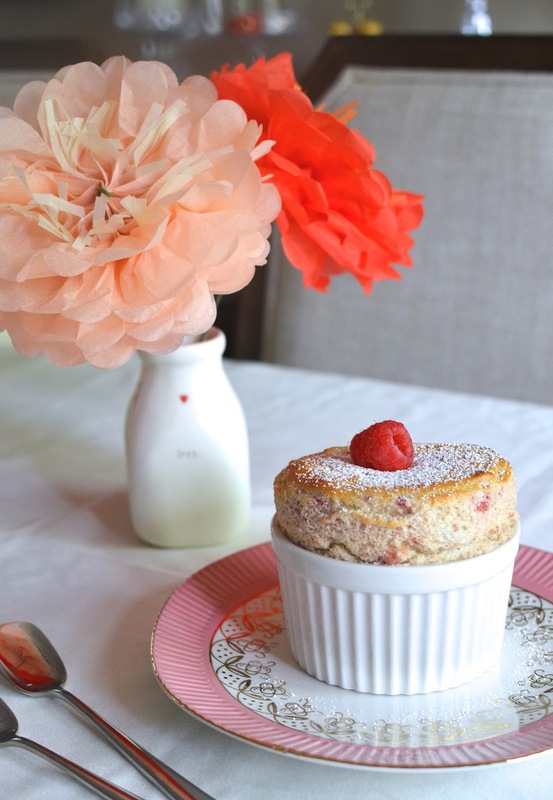 I've never made souffle but I'm glad to see an easy, non-intimidating recipe! What a lovely recipe, anything with raspberries is a winner for me. :) And those scallops make me drool as well. They turned out beautiful. I love the idea of adding fresh berries in this French classic. Well done, Monica. You had a wonderful Mother's Day. Breakfast in bed that is indeed a lovely tradition and a lovely treat. I'm sure you can make a souffle. The ones I've made are easy - my main issue is over-beating the egg whites. If I don't do that, it seems to work. It sounds like you had a wonderful Mother's Day Monica! And these souffles! I LOVE the raspberry twist! I still have yet to try making souffle at home but man do I want to try! 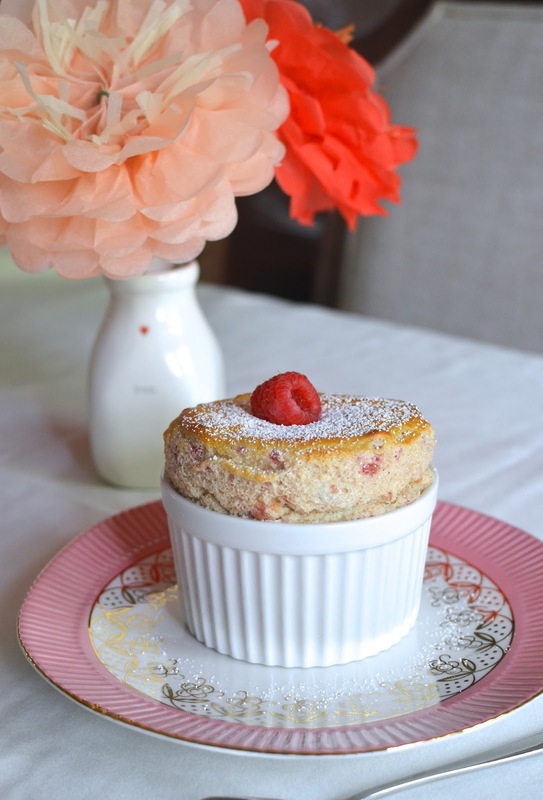 It was fun to make since I'd never had a raspberry souffle before. Hope all is well, Ashley. Wow Monica, the souffles are perfect! I have never had a raspberry one...I absolutely love the idea of fresh raspberries in it. I am totally gorging on all the berries right now so I think I can manage to cook/bake with some since I'm hoarding and they are so plentiful right now. I hope your Mother's Day was nice. You deserve to be spoiled, for sure! Oh my goodness, this look so gorgeous. Monica I admire all your souffle recipes and I think you do have a magic wand in your hand in creating such wonderful recipes. Glad you had a great mother's day! No magic wands necessary, I promise. : ) It's really not as hard as it seems. I hope you had a great Mother's Day, too!! Enjoy the upcoming weekend. 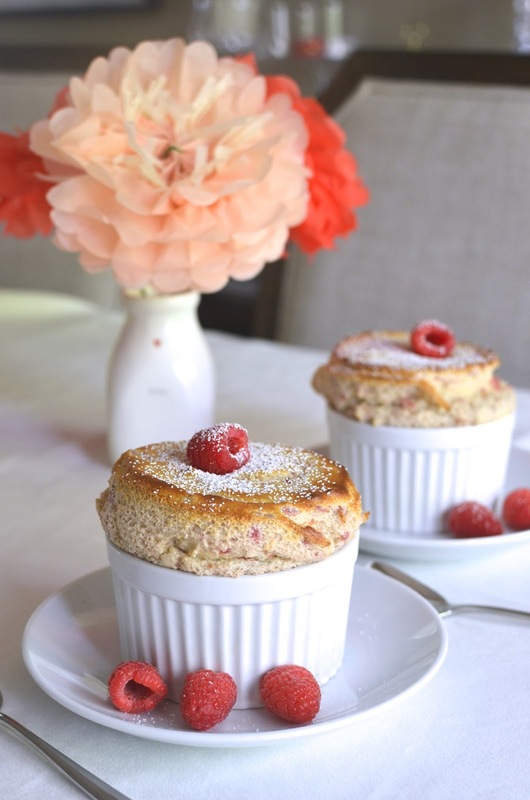 What beautiful souffles you made, love raspberries. Sounds like you had a wonderful Mother's Day!! 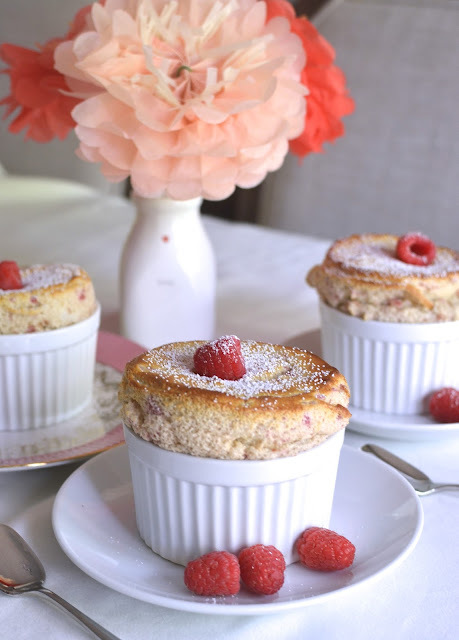 To this day I don't think I've ever made a souffle, but raspberry sounds too good to pass up ~ it's enchanting, and I bet the texture is heavenly. What a beautiful souffle this is and I am so glad you had a great day my day.This is such a great summery dessert. You deserve everything my dear. You are an inspiration Monica. I still have not tried making a soufflé but love the ones you have shared. This is a beautiful dessert and they all look perfect. Glad you enjoyed Mother's Day and hope the weather is better. We're having lots of rain and cooler temperatures right now - crazy spring! You are the inspiring one, Tricia! Believe me! Thank you so much and I know you'll make and slay souffles one day soon. haha. Have a great long weekend ahead!